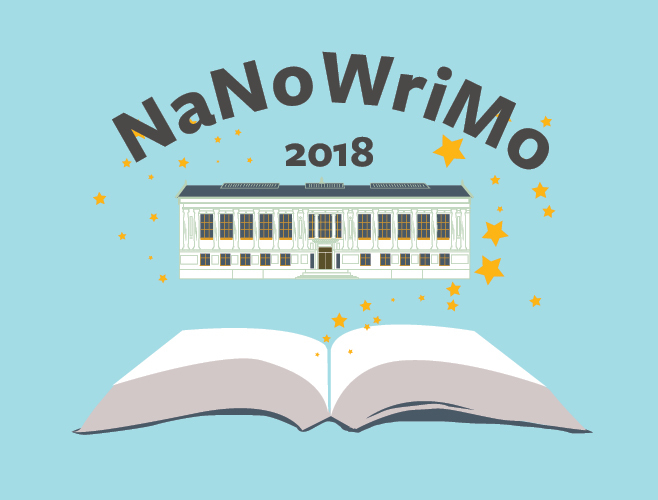 NaNoWriMo is back at UC Berkeley’s Doe Library! Have you ever thought about writing a novel but just didn’t think you had the time? You’re not alone. A small group of friends from the East Bay dared themselves to finish their novels in 30 days back in 1999, creating the foundation of what has become National Novel Writing Month. Since then, this small nonprofit, NaNoWriMo, has inspired a global event of epic proportions! Fifty thousand words in 30 days! Quantity over quality is the name of the game. Turn off your inner editor, and win. Are you working on a thesis, dissertation, or any other writing project (creative or otherwise) but could use a bit of support from the collective energy of fellow students or colleagues to help you stay focused and provide some inspiration? NaNoWriMo isn’t just for novels anymore — be a NaNoWriMo “Rebel,” and work on your academic projects, an article, a chapter, final research paper, memoir, screenplay, etc., and possibly find some new writing buddies along the way! The amazing team over at NaNoWriMo created this worldwide community of writers and a support system of libraries, bookstores, and other neighborhood spaces all over the globe called Come Write In, where “Wrimos” gather and forge ahead toward their word count goals during their quest to win this book-in-a-month contest. With all the positive energy of over 300,000 participants, all writing together, winning is possible. Novelist or academic, all are welcome. I have been a participant since 2007, and the undeniable spirit of creativity that NaNoWriMo cultivates continues to motivate me to keep pushing forward, and I hope it will inspire you as well! The Library attempts to offer programs in accessible, barrier-free settings. If you think you may require disability-related accommodations, please contact Shannon Monroe at least two weeks prior to the event at smonroe@berkeley.edu, 510-643-6151. Leonardo Padura: the luminary Cuban writer at UC Berkeley! Read the 2018 National Book Award Finalists!